I’m not optimistic about the future of our country, or the world, under a Trump administration. I think rights and freedoms we take for granted, including free speech, a free press, and security in our homes and persons, will be degraded under the guise of “law and order.” I think the culture will trend toward hostility, violence, and exclusion. Scientific inquiry, education, and critical thinking will be further disparaged. I think the values of evangelical Christians will be imposed on all of us. I don’t think the promised economic revival will come to pass. I think the environment will be irreparably damaged. I think it will take generations to recover from a Trump presidency, if we ever do. But here we are. It is as it is. I am not without hope, or without determination. We have to work with the new circumstances we find ourselves in. In a shipwreck it’s useless to cry, protest, complain, and blame. Obviously the ship was off course. Maybe the navigation equipment was faulty, someone sabotaged the steering, or the captain was drunk. Maybe we should have all been on deck watching out for land. Whatever. Here we are. It’s also not helpful to just sit on the beach, enjoying the warm sun, saying somehow everything will be OK. The thing to do is to explore the island, find fresh water, build shelter, figure out what’s edible, learn how to hunt and fish, and find a way to get along. Maybe even build a new ship out of the scattered wreckage. It’s time to pick ourselves up, dust off the sand, and get work. There’s no help coming. We have to stick together. We can’t be “Stronger Together” until we can be together. I am fortunate to have seen a lot of the United States. I grew up taking family vacations to State and National Parks, visiting friends and family in other states, and seeing how other people live. As a kid I played pool in bar along the Columbia river, caught fireflies in the yard of my kinfolk in East Tennessee, and visited many of the places my family came from, including Illinois, Michigan, North Carolina, and Tennessee. I went to a Southern Baptist Sunday school, attended Catholic mass with neighborhood friends, and used to visit a local Hari Krishna temple regularly for dinner. I have celebrated friends’ bar and bat mitzvahs at Jewish temples, and attended a family funeral at a black church. One hot summer day, after playing in the river that ran across the back of a relative’s yard in small-town Tennessee, my sister and I got berated by an ornery old guy in a pickup who stopped to inform us we would burn in hell for walking around in swimsuits. Culture shock indeed, for two kids who grew up in a Southern California beach town in the 1960s. I’ve toured groves with California avocado growers, chased cattle on horseback in rural Nevada, and walked all night with a friend down a train track in upstate New York. I’ve worked on open-space cleanup projects with hunting groups, helped build and maintain riding and hiking trails, and worked in a hot little Internet marketing agency downtown. I’ve been involved in amateur radio, general aviation, equestrian groups, traditional music, and martial arts. I’ve led fitness classes for low-income Iraqi immigrant seniors, and I assist in the children’s program at the dojo. Each of these places and groups has its own culture. Even with my privileged exposure to so many kinds of people, there are more to meet and connect with. I have relatives back east who will not visit us in California because of the earthquakes. I used to work with a young man who grew up in the city of San Diego but had never visited the mountains or desert here in our own county. When people talk about the value of travel, and learning about other cultures, they almost always mean international travel. But we have places to see and people to get to know here at home, too. If you can’t get there in person, make friends online, watch documentaries on YouTube, meet people from different cultures in your local area, and read. Failing to get to know your own country is a kind of willful ignorance. Let’s make it a priority to get to know each other better. The executive, legislative, and judicial branches of our government are meant to keep each other in check. Now they will all be working together. That’s a frightening prospect. A free press used to be the fourth part of that system of the checks and balances that made our country work. It gave us a way to keep an eye on what our government was up to. It was the immune system that helped us discover and fight disease. But our immune systems has failed due to years of lying, fear-mongering, politically- and commercially-motivated “news” sources promoting drama over information. Trust has been undermined, such that even reliable sources aren’t believed by many. The commercial media is completely broken. Useless. Stop pretending we can count on the media. They completely failed us. We knew it was happening, we just didn’t want to see it. Now we can’t pretend to be naive anymore. Assume not only that the other guy’s favorite network is spreading lies, but that yours is too. Read, view, refer to, cite, and share source materials. Read proposed bills. Read transcripts to see what was actually said. Watch live broadcasts from regular people (Periscope, Facebook Live, etc.) so you can see what’s happening instead of filtered highlights. Click through to what’s actually being discussed in third-party articles. Don’t trust others’ interpretations – see and hear for yourself. Exercise radical intellectual integrity. Stop spreading crap you know isn’t true. Focus on what’s important, not slips of the tongue, statements taken out of context, snarky memes. Spreading these things is counterproductive. Call out falsehoods, exaggerations, and omissions you see in articles and reports, even when they serve your own interests. Spreading baseless fear riles people up without accomplishing anything. Sharing out-of-context quotes leads to mistrust. Don’t selectively cherry pick just the information that reinforces your beliefs. We need to build community, pick our battles, and fight effectively. Stay well. Take care of your mental, physical, and spiritual well-being. Be active. Go outside. Breathe. Move. Eat well. Rest. Without this, nothing else can be accomplished. Get connected. Meet your neighbors. Stay in touch with friends and family. Keep lines of communication open. Get to know people from different cultures, races, ethnicities, classes, religions, ages, genders, interests, and values. Hillary Clinton said we are Stronger Together, and that is no less true now. Find common ground. Talk to people. Ask what’s important to them, and then listen. There are things we all want. Let’s work together for our shared best interests. This helps build the relationships that allow us to address the issues where we disagree, too. Be informed. Read books. Listen to podcasts. Watch documentaries. Keep in mind the points above. Get out of your comfort zone. Think critically. Speak up. Alert others when you see trouble ahead. Propose solutions. Direct people to information. Let your representatives in government at all levels know what’s important to you, and what you want them to do about it. Encourage others to do the same. Work for good. Find a way to make a difference. Write. Create. Build. Volunteer. Donate. Teach. Pick one or two causes you believe in and actually do stuff to help. I can’t fix everything. None of us can. I can’t even keep an eye on everything. Paying scattered attention to many issues – knowing just enough to complain ineffectively to the folks around me – isn’t productive. I’m choosing just a few focused actions I can take, and issues to stay on top of. Help people stay healthy and sound. Some of the responsibilities of leadership in this area is to share solid information and encourage people to get started. Another, which is crucial to our collective future, is to advocate for increased opportunities for physical activity in schools and workplaces. Whether or not we find ourselves having to work well into old age, without access to decent healthcare, taking good care of ourselves starting now is a smart, safe bet. Even with universal healthcare, a weakened, injured, and sick population is expensive for all of us. This is something I can help with directly. Aikido offers an inclusive community of people dedicated to a better world. It’s a physical and philosophical practice that helps us to be more balanced and and peaceful. When people say “be the change you want to see in the world” the dojo is a good place to do that. I’ve been practicing Aikido since 2009, and will continue training, and invite others to explore the idea as well. You may turn to music, dance, religion, being out in nature… Whatever works for you, I invite you to find it and participate in it. Support access to broadband Internet. For any of this to work we need unfettered access to the Internet. We have to be able to speak out, gather, share, and support each other. We must defend our access to the Internet, and expand it to include the urban poor, rural communities, and everyone else. It’s hard to imagine for those of us with instant access to Damned Near Everything right in our pockets, but many people in the United States don’t have decent Internet access – or any access at all. Many of my rural friends around the country have slow, unreliable, expensive, and limited Internet. They have to wait until they get to work download anything that requires serious bandwidth. They get cut off if they go over their monthly limit. That’s not cool. There will be pushback from the same privileged whiners who complain about “government cell phones” (Lifeline service for low-income people). They’ve got theirs, so why should they help anyone else get ahead? We’re just going to have to fight educate them. It does not help anyone to have millions of Americans excluded from the online world. Access to educational resources, from science blogs for kids, to eBooks from public libraries, to universities offering online degree programs. An infrastructure that enables people to start businesses, sell products directly to consumers, or work remotely when no jobs are available locally. A way to communicate and connect directly with people across the country and around the world. A venue for all of us to seek out and share information. The means for the elderly, disabled, and geographically isolated to stay connected with family, friends, and the world. Access to government resources, information, records, and representatives. Donald Trump was elected, but that doesn’t mean the country as a whole rejected what Hillary Clinton was proposing. Indeed, more than half of voters favored her. In California she received 2.6 million more votes than Trump. There are many, many people who support her proposals, and we should go right on working for them. This is the cause I’m taking up. I invite you to choose something you’re passionate about, and focus your energies on that. I will do my best to understand these issues, follow developments, educate others, share information, and keep pressure on people who can make it happen. Stay in touch with people in government who represent me. Many times I’ve thought “I should write to someone about this!” Occasionally I’ve done exactly that. Most of the time, though, I mean to get around to it later, when I have a minute and can find who to write to. But then I never get back to it. To support myself in more effective communication with my representatives, I am going to create a document I can easily access from anywhere (in my case, that means putting it in Evernote), and keep in it the contact information for each of them right at hand. I invite you to do the same. In the past when I have contacted representatives I’ve sometimes head that I was one of just a handful of people they heard from. I know my input has added to their understanding, and even shifted their thinking in a few instance. I’ve been on advisory committees and even served as an elected member of our Planning Group for several years. What we have to say can make a difference, but we have to say it. I started up my playlist of positive, good-energy music, and we got busy training. We started with slow, flowing, gentle warm-ups, settling into the sensation of the ground supporting us, moving freely and breathing deeply. We work on some techniques from a couple of grabs, then a fun game that helps teach awareness of balance. We continued on to do slow, easy multiple-attacker freestyles, all the while staying with the music, and reminding ourselves to be centered and relaxed. Some stayed for the second class, others went home to watch the election returns. Eventually we all learned how it went. One of the principles of Aikido is to perceive what’s actually happening and actively work *with* it, not close our eyes and hunker down in denial. With that in mind, instead of wishing it weren’t so, or hiding out in the pillow fort of #NotMyPresident, it’s time to actively engage and look for openings to move things in a good direction. Taking care of our bodies and spirits with friends, music, and movement can be part of that. Staying present and focused are good strategies in any work. I am heading to the dojo, as always, this afternoon. Visitors are always welcome. If anyone is looking for a community dedicated to a physical and philosophical practice of peace – a practice that extends into daily life – come join us: Aikido of San Diego. If you’re not in the area, find a dojo near you. How Do We Move Forward Together? Please continue reading below, where I’ve posted additional thoughts, and links to articles and other resources. By this time next week we will know who we have elected to be the next President of the United States. For now, it feels like we’ve fired off our best-engineered rockets to deflect an asteroid headed toward Earth. There is nothing more we can now do but hold our collective breath and wait, hoping our efforts were enough. We won’t know until the icy dirtball either slams into us, or slips by too close for comfort, flying back into the darkness from whence it came. Either way, we will be left shattered by what the experience has revealed about many of our fellow citizens. At this point in the political process everyone has made up their mind, and the outcome will be what it will be. However things end up, we have important work ahead, and healing to be done. These things will take decades, and we need to get started. It’s easy to dislike and dismiss many of the people who have supported Trump. They come across as mean, uninformed, paranoid, fearful, selfish, hateful, angry, and bitter. If their candidate loses it will confirm their belief that everyone is conspiring against them, that they cannot win. Even worse if their candidate prevails. They will soon be sorely disappointed to learn that their big-talking superhero cannot save them after all. He cannot build the promised wall to protect them, cannot expel from the country the 11 million people they blame for many of their troubles, and cannot bring back their well-paying manufacturing jobs. Their lives will not be improved. Their hopelessness and anger will only be amplified. As many have pointed out, Trump is not the problem. Trump’s popularity is only a symptom of the problem. What to do? How do we begin to move forward? Education? Social programs? New industries? Those are how-do-we-get-there strategies. First we have to consider where we are going. We have to work on developing a shared vision for the future of the country. In Aikido we try to connect with our attacker – finding our common humanity – even someone who is trying to do us physical harm. We try to see things from their perspective and, as best we can, resolve conflict to everyone’s mutual benefit. An attacker is someone who has lost control. Someone who is in pain and lashing out. The people who have been supporting Trump are hurting. They feel out of control. They have done their best, worked hard, and followed the rules that worked for previous generations. Many simply don’t have the resources or ability to pull themselves up by their own bootstraps. They’ve been taught to devalue education, science, civility, and compassion as liberal, or worse, feminine. The economy and culture have changed fasted than they could adapt. They have been left behind, and are resentful and afraid. They are refugees in their own country, banding together in an attempt to return to a more familiar time and way of living. But like those whose cities have been destroyed by war, there is nowhere to return to. The only option is to go forward. How do we help them assimilate and become successful, peaceful, and happy in the future that’s actually before us all? p.s. Here are some additional thoughts. [3 Nov. 2016] I first shared a link to this along with this short intro text: “Looking to the future (after next week), and considering how to best help refugees assimilate and become productive members of society.” My post only got one comment, from a friend who apparently didn’t read it, and thought I was talking about immigrants. He said: “The definitive word being assimilate.” Fair enough. That’s still a legit idea in this context – they have to be willing to assimilate. That elicited more discussion, and some good ideas, including expanding educational opportunities, and ensuring everyone has access to broadband Internet, without which education and employment are practically unattainable. The author, Dylan Matthews, reveals that our collective story about Trump supporters being the poor, ignorant sods left behind as the world and economy changed around them, is fiction. That demographic exists, to be sure, and they do need help (see links below to Clinton’s factsheets on poverty and rural America), but they are not Trump’s supporters. “What’s needed is an honest reckoning with what it means that a large segment of the US population, large enough to capture one of the two major political parties, is motivated primarily by white nationalism and an anxiety over the fast-changing demographics of the country. Maybe the GOP will find a way to control and contain this part of its base. Maybe the racist faction of the party will dissipate over time, especially as Obama’s presidency recedes into memory. Maybe it took Trump’s celebrity to mobilize them at all, and future attempts will fail. So, we’re essentially back where we started, just with a clearer picture of the underlying problem. These people are feeling threatened, left out, and afraid. (And like many people who are fearful, they come across as angry, stupid bullies.) They want to go back to what’s familiar. Their efforts to do that present a danger to all of us. How do we get them on board, to our mutual benefit? Or are they so determined to retreat into their comfort zone that it’s just not a possibility? I don’t know. That’s the big question. Are they actually opposed to living in a society where people are treated equally and everyone succeeds together, or do they just think it’s not possible? I am back to thinking in terms of refugees. Is it not possible to assimilate these people into a culture that works better for everyone? In Aikido we try to resolve conflict through non-violent collaboration whenever possible. 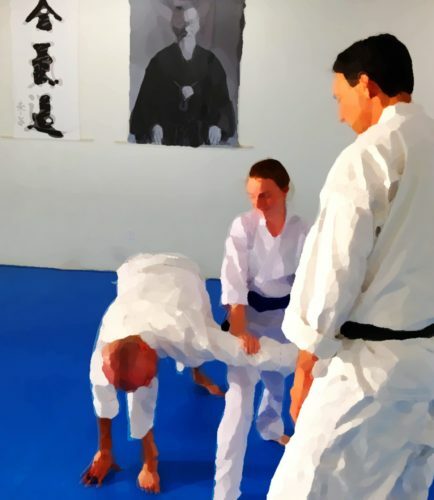 Practicing off-the-mat Aikido – applying the principles we practice in the dojo to situations in life outside – means adopting a new paradigm: conflict does not have to be a zero-sum game, where you have to lose for me to win. As in many of humanity’s popular religions, we practice loving the attacker, realizing that we are not separate, trying to see the world through their eyes. We try to understand what’s at the heart of the conflict. But this does not mean passively tolerating harmful behavior. It does not mean turning and running away, cheerfully accepting blows, or closing our eyes and pretending that the attack isn’t happening. It can mean setting clear boundaries, speaking directly, and taking decisive action. In our practice on the mat this means literally turning to see things from our partner’s point of view, and joining with the direction of their attack. It’s only from that vantage point that we can begin to redirect their energy for a better outcome. Some shed light on the problem. Others suggest solutions. The story of how one young man, Derek Black, who was raised to be a leader in the world of white supremacists. His mind and heart were changed by his friends at college, who took the courageous step of including him instead of turning their backs. “A few people in the audience started to clap, and then a few more began to whistle, and before long the whole group was applauding. “Our moment,” Derek said, because at least in this room there was consensus. They believed white nationalism was about to drive a political revolution. They believed, at least for the moment, that Derek would help lead it. “Ostracizing Derek won’t accomplish anything,” one student wrote. The above link is to the Facebook post about the article. The comments there illustrate the us/them divide that keeps us stuck in this mess. Some are angry, others sympathetic. Many are thought-provoking. Trump: Trump’s platform does not specifically mention food, agriculture, or rural communities, and to our knowledge he has never directly addressed the subject of local and regional food systems. But he recently released a list of agriculture advisors that paints a vivid picture of the sort of policies to expect under a President Trump. The 65 names on the list are a who’s who of industrial agriculture advocates, including senators, governors, state ag commissioners, and agribusiness executives. It’s safe to say that the Trump ag team supports feedlots over farmers markets. Poor white Americans are dying of despair. And racism is to blame. We followed the path we were told to follow. So how did we end up more poor than our parents?